Samsung to Acquire Boxee for $30M: Competition for Apple TV? Samsung may venture into set-top boxes following Boxee purchase. Samsung and Apple are already bitter rivals in the smartphone and tablet world. But yesterday’s acquisition of set-top box maker Boxee could pit the Seoul-based electronics giant against Cupertino’s own Apple TV as well. Samsung will spend an estimated $30 million for Boxee, according to VentureBeat. Boxee, which began as a software company and later expanded into hardware, has offices in both New York and Israel. Samsung will retain approximately 40 employees split evenly between those locations. Earlier this year, Boxee had been looking for additional funding. The decision to sell was made within the past few months, with the company admitting that offers were sparse and lower than anticipated. On the other end of the sale, the South Korean company released a statement saying, “Samsung has acquired key talent and assets from Boxee. This will help us continue to improve the overall user experience across our connected devices.” This likely points to Samsung using Boxee technology in its smart TV sets, as well as a possible venture into set-top boxes to rival the likes of Apple TV. So what exactly does Boxee offer? And how does it compare to the latest Apple TV? 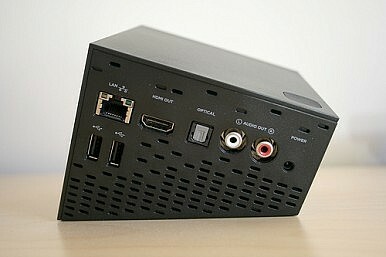 Boxee’s most recent product is the Boxee Cloud DVR. It was released last November and can stream free, over the air television channels. It also offered a premium DVR service that allowed users to record and store an unlimited amount of content to the cloud. The $15 a month service is set to discontinue on July 10. The Boxee Cloud DVR retailed for $99. While outdated, 2010’s Boxee Box was an interesting entrant in the set-top box market. It utilized an eye-catching design – a shiny black cube that appears to be sinking into the surface that it sits atop. Complementing the sleek hardware was perhaps the best remote control to be paired with a set-top box, which included a full QWERTY keyboard that made searching for content much less painful. It was powered by an Intel Atom 1.2GHz chipset. The Boxee Box allowed the integration of third party apps, offered 1080p playback, and even offered two USB ports and a microSD card slot for expanding the memory. Sadly, it was prone to crashing and didn’t manage to include two of the most popular content-streaming services: Amazon Video on Demand and Hulu Plus. It also sold for $99 more than the $100 Apple TV. Apple released its third generation Apple TV in March of last year. The little black box is powered by the iOS operating system, allowing users to stream content from iPods, iPhones, iPads, and MacBook computers using the AirPlay function. It utilizes Apple’s 1GHz A5 processor, and allows 1080p video streaming from iTunes and Netflix (with deep Netflix integration). It comes with a tiny brushed-aluminum remote that matches perfectly with unibody MacBooks – but it is extremely small for users with big hands (although this can be remedied by using Apple’s Remote app if you have an iPhone or iPad). The Apple TV is due for a refresh soon, and only time will tell is Samsung takes full advantage of the solid groundwork laid by Boxee’s unique hardware. The final battle between set-top boxes from Samsung and Apple may come down to the basis of most smartphone rivalry in the world today: Are you an Android person or an iOS person? Classy clamshell will sport a Snapdragon 800 CPU and a 13MP camera.